Very easy in the semifinals, as expected, Genzebe Dibaba flew in the final of women’s 3,000 meters Sunday at the World Indoor Athletics Sopot in Poland. 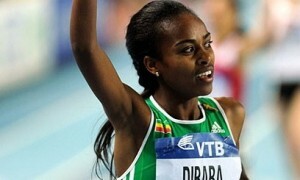 The young Ethiopian has imposed herself in 8 min 55 s 04c to clinch the gold medal. She also held the world record for the distance on February 16 in Birmingham. Dibaba outperformed at the end of the race Kenyan Hellen Obiri (8mn 57s 72). The third place went to the Bahraini Maryam Jamal who finished the race in 8mn 59s 16c.